"My Three Suns" is the seventh episode of Futurama, the seventh of the first production season and the seventh of the first broadcast season. It aired on 4 May, 1999, on Fox. Fry becomes the emperor of Trisol through random lucky occurrences, at the expense of Leela's displeasure with his reckless behavior. This episode also establishes Bender's desire to become a chef. 1.1 Act I: "Goin' through the bot wash..."
1.2 Act II: "A Mouthwatering Neptunian slug!" 1.3 Act III: "You drank our emperor!" 1.4 Act IV: "Fry must die!" Act I: "Goin' through the bot wash..."
Bender goes through an automatic robot wash, much like a typical car wash, while dancing and singing a modified version of the Rose Royce song Car Wash. After he gets out, however, it starts to rain. Act II: "A Mouthwatering Neptunian slug!" Fry and Leela catch Bender watching Elzar's cooking show on the TV at the headquarters and he admits he wants to become a chef. Later, Hermes tells Bender he realized that Planet Express is paying him to do nothing but sit on the couch, watching cooking shows. Hermes tells Bender that he has to do something if he wants to continue working, so Bender decides to be the ship's cook. He takes Fry and Leela down to Little Neptune to buy ingredients for his first meal. On the way to get Neptunian Slug, Fry is distracted by an organ dealer offering to sell some gills, which apparently means he won't need his lungs. 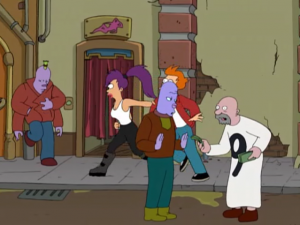 Leela rescues Fry before the "operation" they get meet up with Bender and purchase various ingredients. When they get back, professor sends them with Amy and Zoidberg on a mission to the planet Trisol in the Forbidden Zone, deep in the heart of the Galaxy of Terror. On route to Trisol, Bender prepares a meal full of salt, which the crew finds inedible. 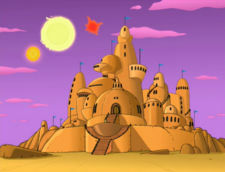 When they arrive, Fry is sent to deliver the package to a castle, but it is too far and the heat of the desert planet make him become dehydrated. When he gets to the castle he drinks a strange bottle of blue liquid - which turns out to be an Emperor. Act III: "You drank our emperor!" Having accidentally assassinated Bont, the Emperor of Trisol, Fry finds himself cornered by Trisolians. Fry thinks they are about to kill him but instead they declare him the new Emperor. Fry appoints Bender as his Prime Minister, and refuses to leave despite Leela ordering him to. During his coronation ceremony Leela takes Fry to a hall with portraits of the former emperors on the walls. Leela tells him that every emperor was killed by the next and that one becomes the new emperor, which means Fry will likely soon be killed. She also reveals that Fry will be killed on the spot if he fails to recite his coronation oath properly. Fry doesn't seem worry and Leela leaves the palace in disgust, swearing not to help him ever again. When the ceremony finishes, the triple sunset of the planet begins and all Trisolians begin to enter their nocturnal phase, the former emperor can be seen in Fry's stomach. The Trisolians attack Fry, intending to cut him apart to free the Emperor. He flees with his friends, and they lock themselves in the Emperor's chambers. Act IV: "Fry must die!" As the Trisolians attempt to break through the door, Amy, Zoidberg and Bender try to figure out how to get Bont out. They try to make Fry cry the Emperor out, though Fry is unable to. The Trisolians prepare a giant juicer that will shred Fry until the emperor gets out. Bender goes to call Leela for help. When Bender calls, Leela is beating a punching bag with Fry's face on it. She refuses to help Bender but later can be seen outside fighting the Trisolians. Bender makes Fry believe Leela was killed by the Trisolians. This makes Fry finally cry out a few tears of the emperor thinking it's his fault Leela "died". Bender's plan is ruined when Leela shows up in the emperor's chambers. She then starts to beat Fry to make him continue crying. Everyone quickly joins in, causing the bottle to fill up. After a long time everyone is too tired to continue but the emperor had already left Fry's body. Bont thanks him for crying him out then beats Fry with a chair, leaving Bender demanding some more time to beat Fry. This episode was rated TV-PG V on FOX, it was later rated TV-14 on Adult Swim, TBS, Comedy Central and is TV-14-LV on WGN America. Trisol is probably a compound of "tri-" (three) and "sol" (sun). This is the first episode in which Professor Farnsworth utters his famous catchphrase, and yet Bender can already tell that it means anything but good news. Leela wears a different colored shirt from her usual in this episode. At the coronation, one of the medals on Bender's sash has an image of Homer Simpson on it. This is one of the only times Bender is shown to spend money, rather than using a coin on a string. The other instance is in "Mother's Day" he claims he has bought gifts for Mom, but this is shown offscreen. The premise of a three-star planet that is plunged into darkness, causing a change in the native population, is very similar to the plot of the film Pitch Black, which was released nine months after this episode aired. Furthermore, one of Pitch Black's main characters is called Carolyn Fry. Bender's apron, which reads "To Serve Man," is a reference to an episode of "The Twilight Zone", in which the statement's apparent meaning, being servile to man, is in fact wrong. The statement is actually the title of a cookbook, thus serving man for dinner. The entire scene in Little Neptune seems to be a somewhat vague reference to Chalmun's Cantina scene in Star Wars Episode IV: A New Hope. Both seem seedy, have a menagerie of robot and alien denizens, and both feature the main characters going into a place that sell food. Also, the scene where Fry is saved by Leela from the Organ Dealer and his accomplice is similar to when Obi-Wan Kenobi saves Luke Skywalker from Cornelius Evazan and Ponda Baba. Forbidden Zone and Galaxy of Terror are both the names of classic B-movies. In Little Neptune, a Neptunian is seen haggling with the Number 9 Man. However, he only has two arms. Perhaps he is an amputee. Having two arms may have to do with genetic differences, like eye color in humans. At the pre-coronation gala, Fry pours a drink for a Trisolian and says, "There you go," but his lips don't move. When the suns are setting after Fry finishes the oath, Bender can be seen with a martini. It then changes to a champagne glass which he then throws out, saying that he can switch to hard liquor and pulls out another martini from his chest cabinet. The emperor would have been digested by the time the Trisolians started to glow and Fry wouldn't have been able to cry him out. Without knowing the composition of the Trisolians, it is conceivable that they are not digestible by stomach acid or peptidases (digestive enzymes). Fry would still most likely have urinated out the Emperor, since at least one day passed, most likely more. Throughout the episode the three suns keep changing size, mainly the largest one. Perhaps it is the distance from the planet that changes. In a three-star system, each star's gravitational pull on the other two, not to mention the combined force on the planet, would cause the planet's distance from any one star to fluctuate widely throughout the day. In the palace, Zoidberg's tongue is orange even though it is normally blue. Fry should have been killed during his coronation, since he obviously misspoke. Maybe there's a three strikes system or the execution rule is only for large mistakes or everyone in the audience was so bored they didn't notice. Leela: Listen, this is Bender's first meal and he's a little sensitive. So let's be supportive, OK? Leela: [Shouting.] Oh, dear God! Bender: It's salt with water in it, if that's what you mean. Fry: [He waves his hand in front of his eyes.] My vision's fading. I think I'm gonna die. Professor Farnsworth: A mysterious world in the darkest depths of the Forbidden Zone. Professor Farnsworth: Why, of course! It's just a name! Like the Death Zone or the Zone of No Return. All the zones have names like that in the Galaxy of Terror! This page was last edited on 2 July 2017, at 06:52.